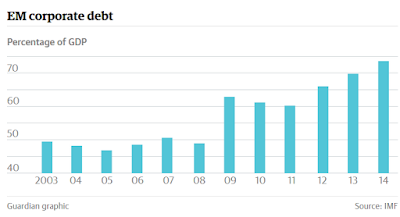 Mish's Global Economic Trend Analysis: Why Are Mules Stubborn? Why Can't Blind Jackasses See? Here's my theoretical question for the day: Why are mules stubborn, and why can't blind jackasses see? I ask that question in regards to a few recent news articles. One is on Japan, one the US, and one on emerging markets with various overlaps in between. The Financial Times reports Japan on Brink of Technical Recession. Japan is on the verge of a technical recession after data on industrial production raised the prospect of a second consecutive quarter of negative growth. Industrial production for August — a crucial input into gross domestic product — unexpectedly fell by 0.5 per cent on the previous month after a 0.6 per cent fall in July. “It’s likely we’re already in technical recession,” said Masamichi Adachi, senior economist at JPMorgan in Tokyo, who forecast an annualised contraction of 1 per cent in the third quarter after 1.2 per cent in the second. In an interview with the Financial Times this week, Mr Abe’s economic adviser, Etsuro Honda, said additional fiscal stimulus was an “urgent task”, while an increasing number of analysts expect the Bank of Japan to expand its monetary stimulus at the end of October. The BoJ has a wide range of policy options for further easing. It could increase the rate of asset purchases from the current Y80tn ($670bn) a year; expand the range of assets it buys; or use communication tools to signal how long it will keep monetary policy loose. The Guardian reports IMF Warns of New Financial Crisis if Interest Rates Rise. In Chicago, Mayor Rahm Emanuel wants to hike taxes to counter falling tax revenue thanks to corporate business flight. Businesses and individuals alike are exiting the region because taxes and the business climate are too unfriendly. I discussed this setup in Obama's "Model for US" Plant Moves to Canada; Mish's Model vs. Obama's Model. After misleading markets for months, with the claim that it would finally raise the near-seven-year-old, near-zero Fed Funds rate in September, the Fed last week reneged, on the grounds that the global economy was too weak for it. A rise of merely 25 basis points can undermine global economic growth? That’s silly – and no less so than the claim that the Fed’s zero-interest rate policy (ZIRP) has “stimulated” economic (or credit) growth. All major central banks have imposed ZIRPs in recent years; economic growth has been weak not despite ZIRPs but in part because of them. 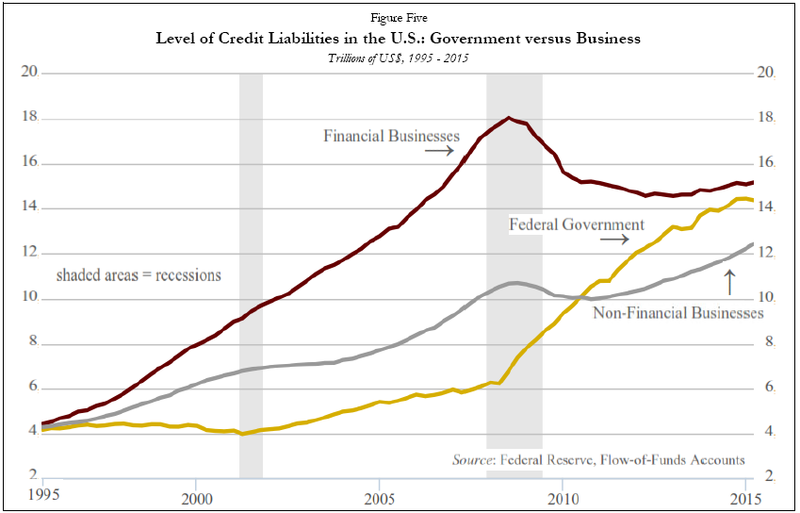 Credit to Washington now exceeds credit to non-financial business, by $2 trillion. Which one produces wealth? No wonder the expansion of the past five years hasn’t been vigorous; but of course Keynesians applaud deficit-spending booms and national debt buildups, as means of saving and stimulating the economy, when all else fails. Things would have been far worse, they say, had government credit not displaced business credit. Yet economic growth was both steady and more robust in the decade after 1995, when credit for business expanded relative to credit for government. Why then are so many other monetary central planners taking this ruinous road and staying on it, exit after exit after exit? Because they’re central planners; it’s what they do. Stupid, stubborn things. Consider: Japan already has had a ZIRP for fifteen years, amid prolonged stagnation; the U.S. has had a ZIRP for “only” seven years; if the Fed were to match the duration of the Bank of Japan’s idiocy and stubbornness, it would persist with a ZIRP until at least 2023. That’s a lot of U.S. economic stagnation to (not) look forward to. Why does the IMF support the very low rates that brought about the conditions it now seeks to fight? Why does Chicago Rahm Emanuel propose tax hikes when tax hikes are the problem? Why can't president Obama, like Rahm Emanuel understand why businesses move out of countries and out of states? Why do economists in general, central banks in general, and the Bank of Japan specifically, all support policies that have been a proven failure in Japan for decades? Why cannot any of the above see that debt is the problem and more debt and measures that foster more debt cannot possibly be the solution? The circuitous answer to all the above question is "Mules are stubborn because they are mules, and blind jackasses cannot see by definition." By the way, I would like to point out one aspect of that excellent article by the Capitalist Advisor they failed to mention but I am confident they understand. 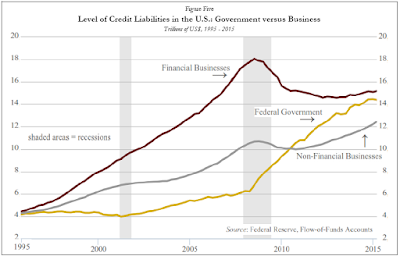 Although credit liabilities of the federal government have risen above non-financial businesses, the latter is expanding sharply for precisely the wrong reason: Corporations have gone on a debt binge, not for business expansion, but rather to buy back their own shares at obscenely overvalued prices. It is impossible for this to work out well, so it won't. ... Except of course for the CEOs and executives who cash out all their stock options every month and park the money in US treasuries. Those who whine about income inequality, notably Janet Yellen and various Fed members, ought to take this into consideration. But they won't. In fact, they can't for three reasons. The Fed consists of a group of central planners. Central planners do stupid things. They won't change because central planners are more stubborn than mules, and as blind as blind jackasses. The central planners and blind jackasses are in firm control. Those in academic wonderland as well as most mainstream media are aligned with the mules and jackasses to strengthen that trend.